We've tried out the Makeblock mBot 1.1, the updated version of the mBot robot that we have previously reviewed and used in projects. We're big fans of Makeblock's mBot range of robots for kids. We've returned to our original mBots over and over and recommend them to kids at our Coder Dojo. 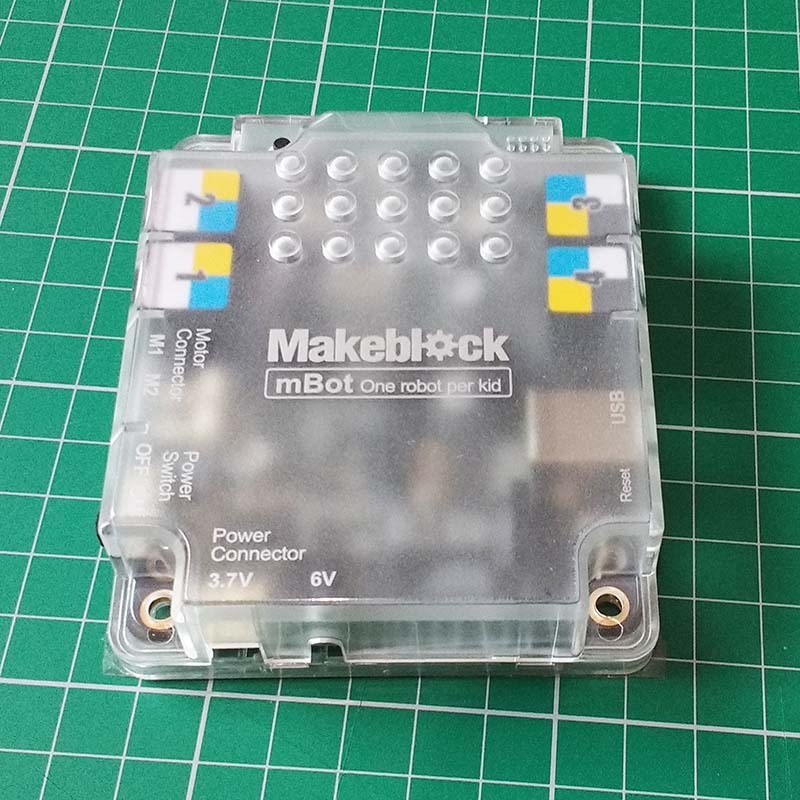 Disclosure: Makeblock kindly sent us an mBot 1.1. to review. We previously backed the Kickstarter project for the original mBot. As always, our opinions are our own. For a detailed review of the capability of the mBot please see our mBot Robot Review. In this review we'll focus on the new features. mBot must be assembled before it can be built. The required tools are included and older children should be able to do this with minimal support which means they feel like they built a robot without too much pain! mBot has a gorgeous powder-coated metal frame and you can buy add-on parts to build additional features on top of the mBot base. Makeblock also make robotics kits and components for adults so there's a natural progression to more advanced robotics. 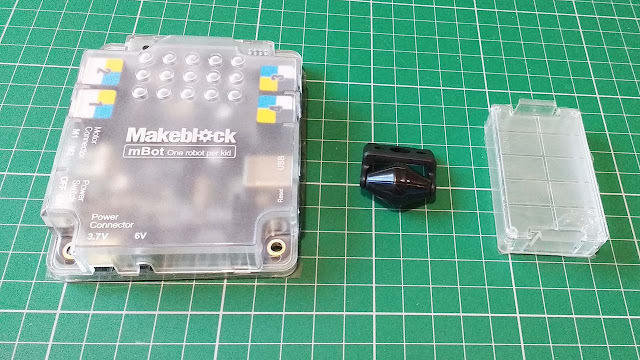 Makeblock set the standard for tech toy packaging. The mBot v1.1. comes in a gorgeous tough cardboard box with a magnetic clip. The box is covered in useful information. One small improvement would be to make the required battery information larger as this is information that parents will want to know in advance. 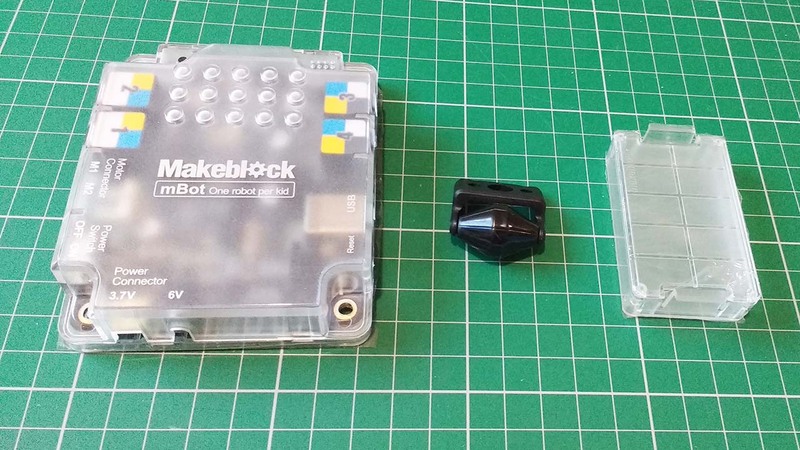 The box can be used to store a built mBot and its accessories if you removed the inner packaging. It's so easy for kids to lose important parts from tech toys and this can cause major problems. Having a box that you can actually use to store the parts is so useful. In our programmable robots for kids comparison, one of our categories is LEGO compatibility as in our experience this can really add to the long-term engagement value of a robot. The original mBot wasn't LEGO compatible. Well the new case has studs on it so that you can attach LEGO or other compatible building blocks. This gets a big thumbs-up from my kids. The case also disperses the light from the LEDs which are pretty bright and protects the electronics. The new mBot has a plastic caster rather than the metal one one of the earlier models. The new caster is much smoother. My kids assembled our previous mBots and mBot Ranger so they let me have a go this time. The parts are really good quality and well designed and the required tools are included so the process is painless. You do feel like you've actually built a robot though. It's a nice compromise between pre-built robots and complex kits of parts. The new mBot v1.1 doesn't include a remote. 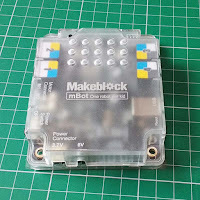 This isn't a problem as there are plenty of other ways to control the mBot but it is useful for out of the box control and creating a robot that doesn't need to be connected to a tablet or PC for input. You can add the remote and it works well so it's worth considering as an optional extra, my son did use a remote initially. The apps mean the remote isn't necessary though. My eight year old was the tester for mBot. The first thing he did was grab a LEGO figure. He was slightly bothered that the odd number of studs means that he can't centre a minifigure! He solved this by placing Bart Simpson sideways on in skateboarding mode which made him very happy! He quickly figured out that pressing the physical button on the mBot puts it into different modes. He started with obstacle avoidance which works well for obstactles that are directly in front of the robot and less so for those that is approaches from the side. It's pretty impressive to see the mBot wandering around and changing direction to avoid things. Next my son tried the line following mode with the included mat. Line following was something we struggled to get working effectively with the original mBot. It's tricky to get right and we've seen it fail in plenty of robots. We were therefore pleasantly surprised when mBot 1.1. effortlessly followed the line over and over again. The mBlockly App wasn't available when we got our original mBots so my kids programmed them in mBlock which is based on Scratch. mBlock is fantastic and my kids love it. The only downside to mBlock is that my kids have to go to their laptops rather than just sitting on the floor playing with their robots. mBlockly means that mBot can be programmed from a mobile device. We loaded up the mBlockly app on my son's iPad and it connected instantly and we were up and running. mBlockly will be familiar to kids who have used other drag and drop programming languages. My son was very impressed that he could program the mBot from mBlockly and still access the pre-programmed modes from the remote control. There's also the Makeblock app which my older son really likes using with the mBot Ranger. This app comes with a default dashboard which can be used to control the mBot from a tablet. You can create custom dashboards and add code using a drag and drop editor. You can buy a wide range of add-on components for mBot which allow kids to build interesting robotics projects on an mBot base. There's lots of scope for extension. mBot can also be programmed with Arduino which is widely used by hobbiests and for creating one off projects. Arduino is a very useful skill to have. 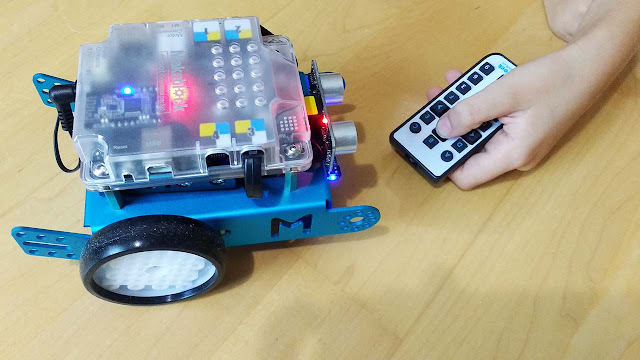 The ability to program mBot in Arduino means it's suitable for teenagers and even adult beginners. 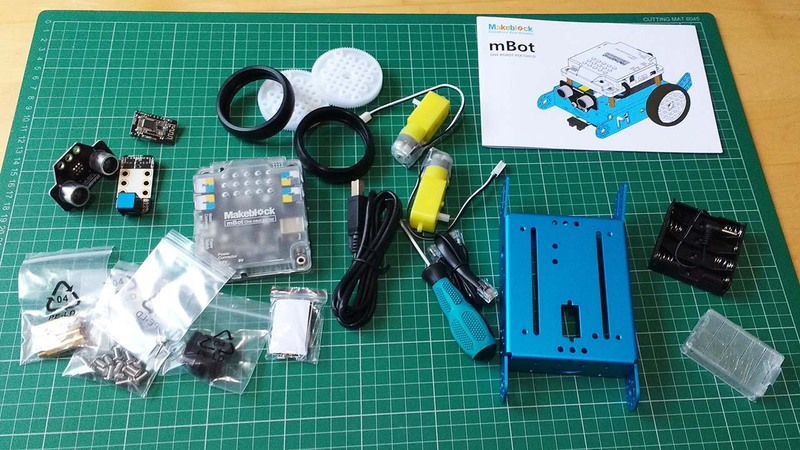 Makeblock make a huge range of robotics kits and components for adult enthusiasts so there's a really good path for kids to follow as they get more experienced. This is an important feature for kids who are likely to get really into robotics as they get older. There is some educational material available for mBot but it's not as accessible or complete as for some other robots and some of the translation to English is a little quirky. Our Roby the robot dog series of posts where we build a robot dog on an mBot base and include mBlock code will give you some ideas of what is possible. 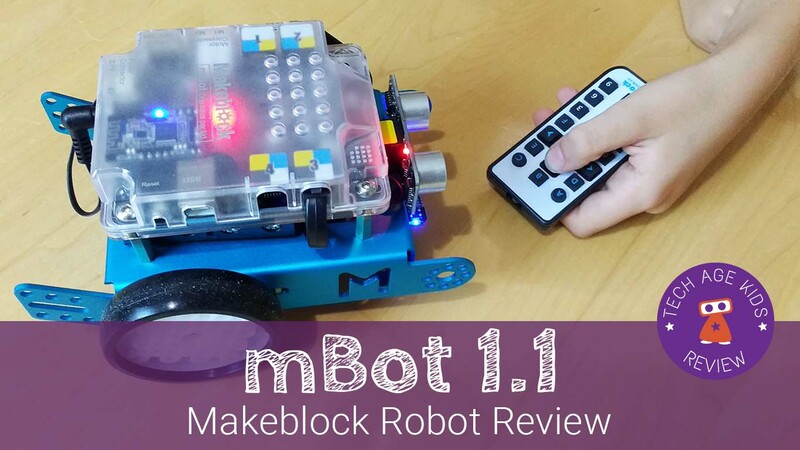 The Makeblock mBot was already one of our favourite programmable robots and one we often recommend at our Coder Dojo. The new updates to the robot and to the software make it even better. The LEGO compatible studs on the new case are very popular. We've explored the apps with the new mBot 1.1 whereas we'd mostly used mBlock (Scratch-based) for coding before. We're impressed with the way the apps connect instantly to mBot via Bluetooth and at how well-designed and easy to use they are. 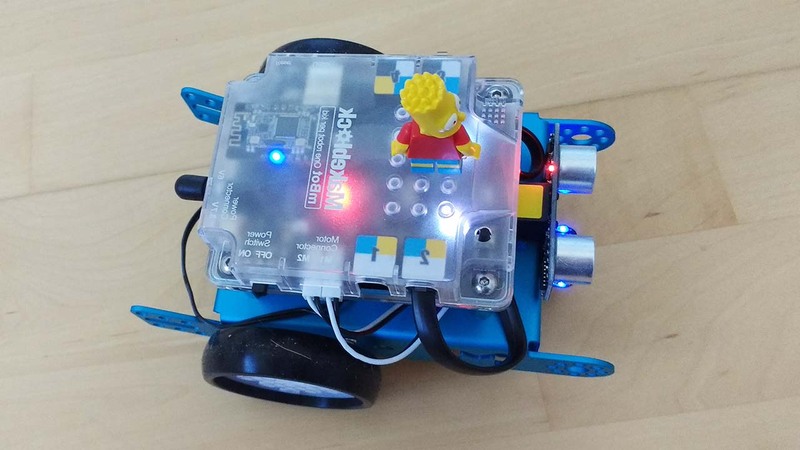 We'd recommend mBot v1.1 for a child who is interested in STEM subjects, especially technology and programming, and with a family member who will help them get set up with the apps and mBlock software, supervise the construction and help them learn what the robot can do. It's probably not the right choice if you just want a toy or have a child who would be put off by the physical assembly. There are cheaper robots available but mBot packs in a lot of technology and the quality is excellent. mBot 1.1 is a great option for a future robotics engineer. Also check out the mBot Ranger which is a larger 3-in-1 robot from Makeblock. mBot 1.1 is available to buy on Amazon. For a wider range of accessories and to register to get $5 off coupon check out the Makeblock store.